If you’re a driver, chances are you’ve received a parking ticket at some point in your life. Maybe it’s because the meter ran out before you got out of the store. Or perhaps you simply didn’t read the parking signs correctly — or didn’t see one at all. Maybe you were even one of the Pinkberry fanatics who chose to park illegally because the $60 parking fine was worth it in order to get your fro-yo fix. Noncompliance with environmental regulations can occur in much the same way. You might not be familiar with the finer points of a certain rule, or that the rule exists at all. Perhaps the language was so difficult to understand that you thought you were in compliance, but a niggling Oxford comma fouled it all up. Or maybe you’re one of those who tried to buck the system — or at least tried to get away with being noncompliant just for a little while without getting caught. Whatever the reason, it’s just a fact of reality that facilities — wittingly or not — sometimes find themselves in noncompliance. The most common reason facilities find themselves in noncompliance is due to permit conditions. Based on how the regulations are written, a facility must comply with the conditions noted on the face of their permits (see Rules 203 and 3002) — even if the condition is impossible to comply with. I’m not kidding. (That’s one reason you should always review your permit conditions as soon as the permit is issued. You can read more about that in our post “6 Common Air Permit Problems [And How to Fix Them].”) It can take six months or longer to get a permit condition modified by the South Coast Air Quality Management District (SCAQMD), during which time the facility is still considered to be in noncompliance (i.e., fees are adding up). Another reason this might happen is when there’s a part of a rule that’s not possible to comply with because the rule omitted a type of operation or facility. In this case, a variance may be needed until the rule gets changed — which can take years to happen. In both these cases, the most common step to take is to file a variance petition with the SCAQMD’s Hearing Board. (Note: Envera Consulting is not a law firm and I am not a lawyer, so this should not be taken as legal advice. If you are seeking legal advice as it relates to the Hearing Board and a variance, please talk to an attorney. We work with a few who I am more than happy to recommend). A variance is an administrative exception to a law. 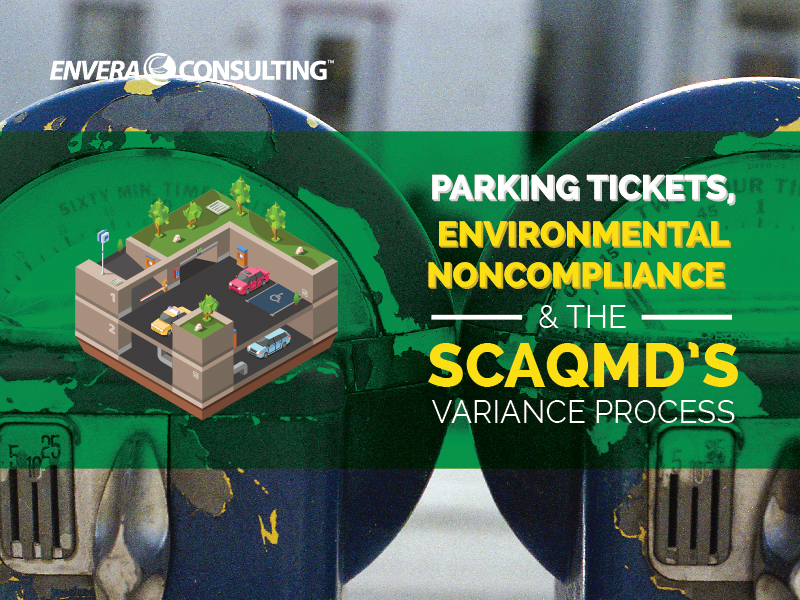 A variance allows a company to continue operating in violation of SCAQMD rules without penalty while it takes appropriate steps to meet air pollution control requirements. Variances can be granted only by the SCAQMD Hearing Board, not by SCAQMD inspectors or engineers. So if you find yourself in a situation where you are or will be in noncompliance, you may be eligible for a variance, which will allow you to continue operating until the larger problem is sorted out. But keep in mind that a variance can only be granted in certain situations — and only by the SCAQMD’s Hearing Board. The SCAQMD’s Hearing Board is a quasi-judicial panel that is authorized to hear and decide if variances can be granted, as well as some other issues we won’t go into in this post. So there are quite a few criteria to meet in order for your variance to be granted. What rules and permit conditions are you in violation of? How and when will you regain compliance? What are the excess emissions, if any, during the time of noncompliance? What is being done to mitigate emissions during the time of noncompliance? A variance hearing is very similar to something you’d see on The People’s Court, so it comes with about the same amount of stress and bureaucracy as you’d experience when contesting a parking ticket (although, depending on how bad a driver you are, probably more costly). There is a panel of the five board members, an area for witnesses to testify, and places for each of the two opposing parties — the petitioner (you) and the SCAQMD’s representatives. During the hearing, you present evidence and answer questions under oath. Most people retain the help of an attorney when appearing at a variance hearing, although doing so is not required. If you want to submit any documents for consideration, you need to bring eight copies. You’re also allowed to bring technical experts, such as those who will demonstrate how you will regain and maintain compliance. The SCAQMD actually has a video that gives a pretty good overview of what you can expect, particularly if you’ve never attended a variance hearing. You can download the video here. The only difference between the variance types is the amount of time the Hearing Board has to conduct a public notification (emergency and interim) as well as the amount of time needed to comply with the SCAQMD’s rules (short vs. regular). An attorney can walk you through the different types and the proper time frame for filing the petition. A qualified attorney should also be able to tell you your chances for even getting the variance before going to the Hearing Board. Just as you should make every possible effort not to park in the fire lane, you should make every possible effort to stay in compliance. However, life happens, you get a Pinkberry craving, and sometimes situations crop up where noncompliance is inevitable. In those cases, a variance may be your answer for continuing operations without getting your facility towed (i.e., falling deeper into hot water).